My Etsy shop launched July 5, 2007. I can’t even remember, I feel like I’ve always been crafting! I remember making all kinds of things when I was younger. Looking back though, I think I was always drawn toward fiber related crafts. I later went to college to be a textile designer. I guess I can trace it all back to my “Knit Magic” and Fisher Price loom. A friend I worked with opened a shop when Etsy was very new and was always raving about it. (heatherjeany.etsy.com) From the moment I heard about it, I thought it was awesome and eventually started buying on Etsy. I figured I’d give selling a shot, basically because Etsy made it so easy. Aside from just making stuff for myself, I didn’t have much involvement in the craft world. I remember thinking “I’m crafty, but not artsy.” I loved watching this Handmade Revolution start and I’m excited to have become a part of it. I have a day job working for a small graphic design studio. I make mostly travel journals and have recently started making photo albums too. I do it all by myself in my small apartment in Providence. No one helps me beyond giving me lots of moral support, enthusiasm and keeping me well fed. Make what you love; someone else out there will love it too! Take really good photographs, be as descriptive as possible and get involved with other local crafters. Plus, buy handmade. I’m a strong believer that if you want people to support what you’re making and doing, make it a habit of supporting other people trying to do the same thing. Aside from periodically stabbing myself with a needle and trying not to bleed on the white paper I’m binding together, I’d say it’s finding the time to design new product. I find it more of a challenge to find the quiet time to devote to coming up with new products and working out new ideas then in actually binding. I sell my books at Craftland in Providence every December. I’m hoping to get more involved this year in my local art scene and expanding where I sell my work. Yes you will! That’s why you need a journal! I’m a bit of a bibliophile, so when I had a one-day bookmaking workshop back in college, I immediately took to it. I loved that it was also made of fiber, involved sewing and had a deep history; a lot of the same things I love about textiles. I didn’t do much bookbinding though for years afterward. 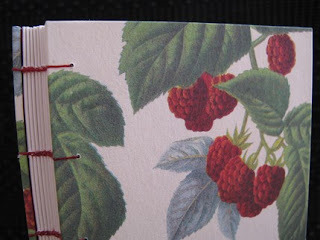 Around 2005 I took a bookbinding class at RISD and have been doing it ever since. I’d say I’ve been pretty consistently making books since around early 2006. Once I opened my Etsy shop, it really picked up speed. I do mostly Coptic journals. I love how flat they lie when open. I love any books with a gorgeous exposed spine. It would be a toss up between a nice sharp exact-o blade and my curved needle. 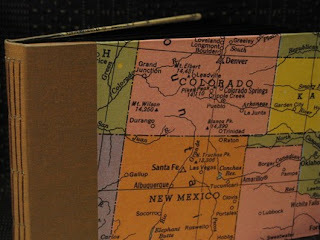 I do mostly travel journals, so I use a lot of maps for my covers. I buy a lot of old atlases in used bookstores and sometimes go to my local map store if I have a custom order for a specific place. 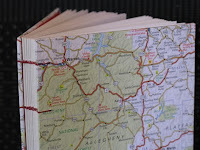 I get a lot of custom orders from people going some place who want a special journal just for that trip. I love thinking that even if I’m not going to South Africa, or New Zealand or Hawaii ¬– at least my journal gets to go. Traveling is one of the most inspiring things for me. I think it’s the feeling of everything around me being new and unfamiliar that lets my brain get out of its comfort zone. I also love books (big surprise, I know) and am constantly flipping through books when I need a spark. Also, my textile background gives me a special appreciation for repeating patterns, texture and structure. I can get inspired just walking through a store with gorgeous papers or yarns. I love the journals of Hannah Hinchman. They’re just unbelievably gorgeous. I think I’d give the hero label though to anyone out there who is making what they love and is able to make a happy life while doing it. Nice feature! Kristin's books are so lovely, and it's nice to learn more about the creator behind the books!